Katie Pumphrey crossing the Potomac River from Maryland to Virginia, and back again totaling 15 miles. 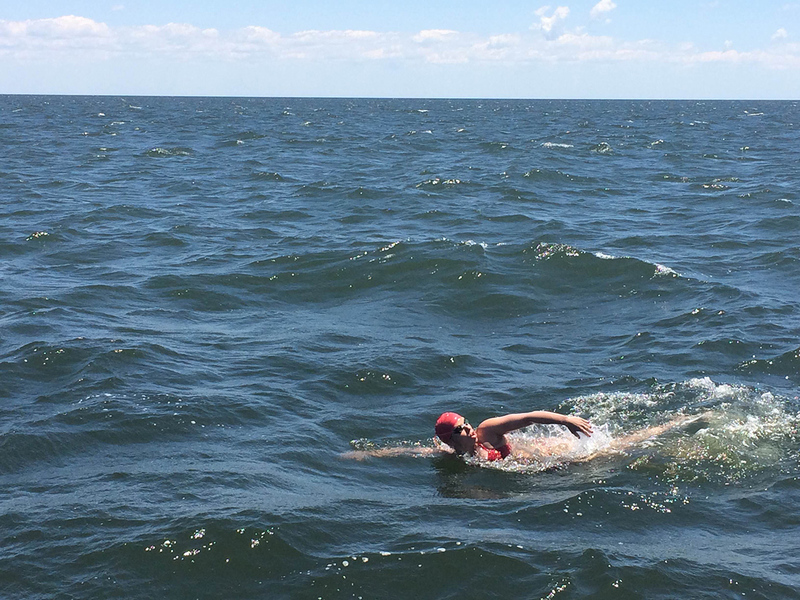 On May 31, Baltimore artist Katie Pumphrey, 26, completed a 15-mile swim in the Potomac River, as preparation for next summer’s attempt to cross the English Channel — a 21-mile, open-water affair that is legendary test for endurance athletes. Pumphrey’s story attracted attention due to this detail: she suffers from a chronic-pain syndrome called fibromyalgia. Chronic pain is a mysterious category of ailments that includes irritable bowel syndrome, chronic fatigue and, depending on the definition, Gulf war syndrome and post-traumatic stress disorder. These hard-to-treat conditions are major causes of disability, especially among women; some sufferers are trapped in a descending spiral of pain, fatigue, drug use, fear and disability. Usually, physical pain starts as a signal from part of the body that is damaged, inflamed, deformed or diseased, but chronic pain takes a very different path, says Daniel Clauw, a professor of anesthesiology, rheumatology and psychiatry at the University of Michigan. 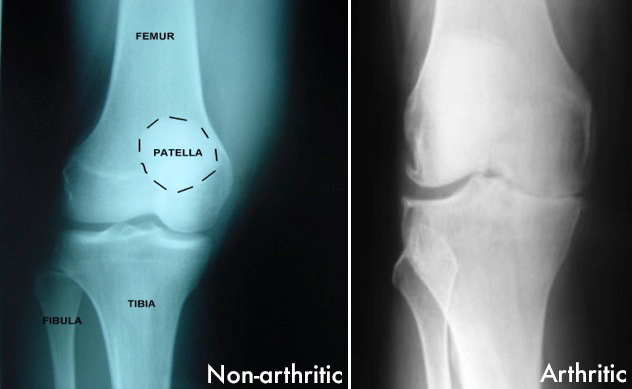 The arthritic knee on the right has lost the cartilage that normally cushions between the bones. It certainly looks painful, but the owner of the knee on the left was the one who complained of chronic pain. Although joint, bone and skin problems are often present in chronic pain, “there are people with damage to tissues who don’t have pain, and a lot of people without damage who do have pain,” says Daniel Clauw, a pain expert. Fibromyalgia syndrome, a musculoskeletal disorder with tenderness, sensitivity, reduced pain threshold, widespread pain and crippling fatigue. The name derives from Latin fibro (fibrous) and Greek myo (muscle) and algia (pain). Irritable bowel syndrome affects the gastrointestinal tract, causing abdominal pain and abnormal bowel movements. Roughly 7 percent of adults are diagnosed, but some studies report a figure closer to 15 percent. Chronic fatigue syndrome: crushing fatigue that interferes with well-being, is not allayed by bed rest, and is not related to physical or mental exertion. Other conditions may be considered chronic pain, including lower back pain, migraine, interstitial cystitis (which affects the back), Gulf War Syndrome, and post-traumatic stress disorder. Speaking in early June at a seminar for judges sponsored by the American Association for the Advancement of Science and hosted by the Neuroscience and Public Policy Program and the Law School at the University of Wisconsin-Madison, Clauw highlighted the disconnect between physical condition and pain perception with two knee X-rays. Women, he noted, are about 2 bars farther to the right on the curve. “Every chronic pain condition is 1.5 to 1.75 times more common in women than men.” This, rather than damage on the periphery (meaning outside the central nervous system), explains why women have more chronic pain, he adds. In arguing that central nervous systems with this exaggerated processing of nerve signals are instrumental to chronic pain, Clauw is not claiming that chronic pain is “psychosomatic,” something fabricated in the brain. Sensory input, he says, often triggers and then feeds chronic pain. Perception of physical pain, experts say, is not a simple matter, as it’s affected by multiple factors. 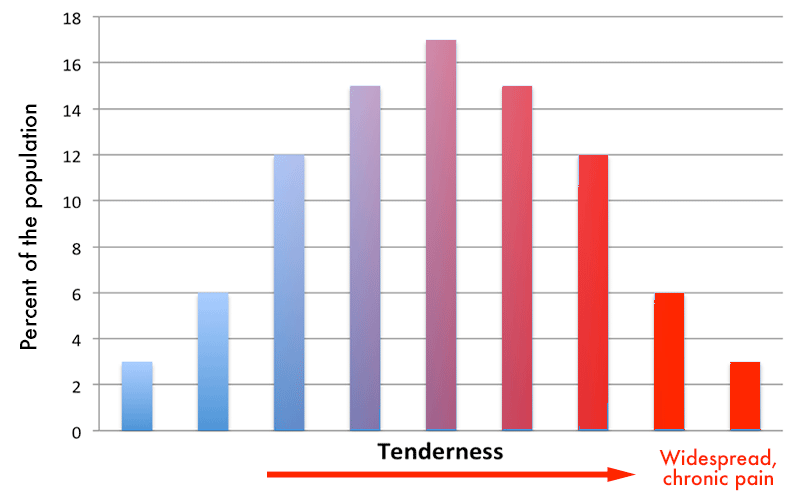 Repeated pain can make some people more sensitive; others, less sensitive. 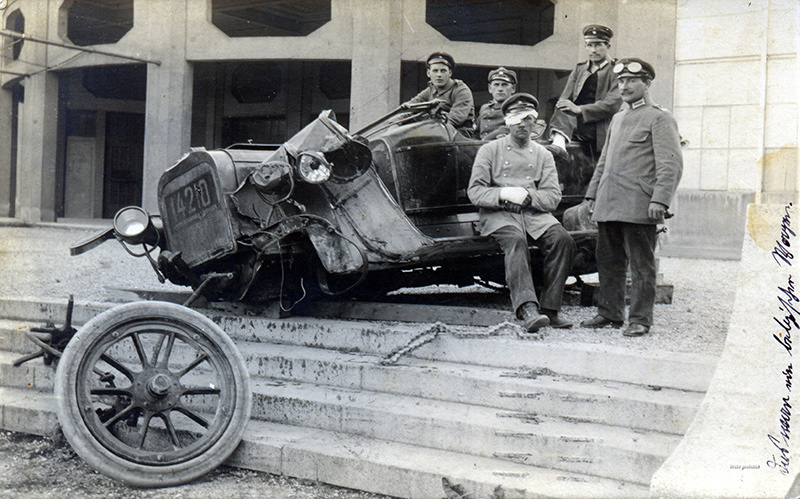 Pain can diminish when we pay attention to something interesting, important or threatening. Drugs and neurotransmitters (chemicals that carry signals in the nervous system) can deaden or enhance pain, and they have different effects in different parts of the brain. Peripheral nerves send pain impulses to the brain, but the brain can also send pain-dampening signals out to the spinal cord. 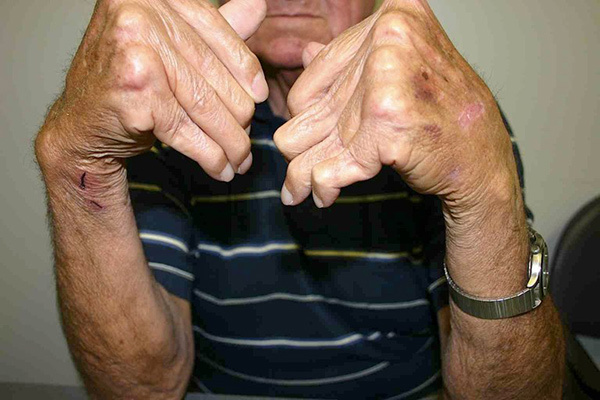 An elderly gentlemen with arthritic hands. Rheumatoid arthritis can cause long-term pain, but usually without the centralized element that amplifies the sensation of pain. “The biggest problem in the pain field,” Clauw says, “is recognizing that the most common causes of chronic pain” result from heightened sensitivity, called “centralized pain.” Clauw sees further evidence in the prevalence of such symptoms as fatigue, pain and disorders of memory and sleep in many chronic pain syndromes. Estimates of the prevalence of chronic pain vary widely. A 2013 study1 asserted that 100 million Americans have chronic pain. German researchers2 found that 19.4 percent of its sample had non-disabling chronic pain, defined by the International Association for the Study of Pain as “pain without apparent biological value that has persisted beyond the normal tissue healing time.” 7.4 percent had disabling chronic pain. American veterans of the 1991 Gulf War exhibited Gulf War Syndrome, with many classic symptoms of chronic pain, including fatigue, pain and memory disorders. Exposure to toxic fumes from Iraq’s Scud missiles was cited as a possible cause of Gulf War Syndrome, which is now considered one type of chronic pain. 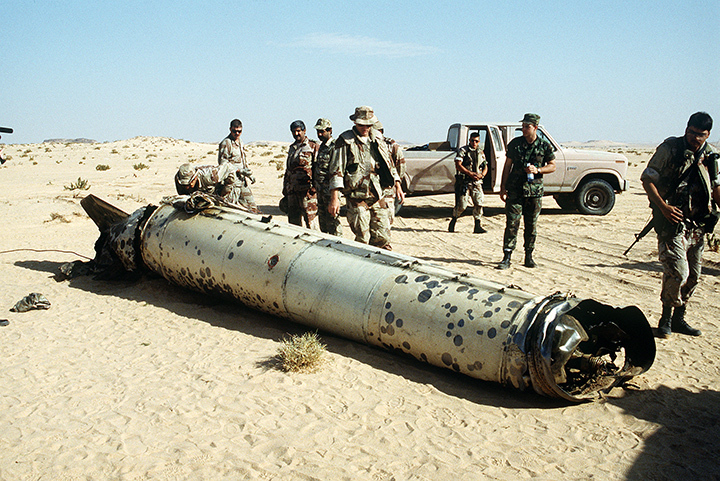 This Scud was intercepted by a U.S. Patriot missile. Clauw sees more evidence for the centralized pain hypothesis in drugs that alter brain chemicals, and can treat both psychiatric illness and chronic pain. For example, the antidepressant Cymbalta, “is now effective for chronic lower-back pain, or osteoarthritis,” says Clauw. “It’s not working as an anti-depressant; it’s literally turning down the volume of the pain system” by affecting levels of the neurotransmitter serotonin. Other drugs, including opiates, simply fail in centralized pain, Clauw says. Chronic pain presents treatment dilemmas. Many patients have overlapping complaints and have been taking a variety of drugs for years, even decades. Some have surgeries, even joint replacement, with little relief. Although some drugs work a bit for chronic pain, many experts prefer to focus on exercise, starting with becoming more active in daily life, walking and swimming. “The few people I have seen who have gotten all their symptoms under control have done it through exercise, mostly aerobic,” says Muller. Naval officers exercise with buoyant dumbbells in a warm therapy pool. 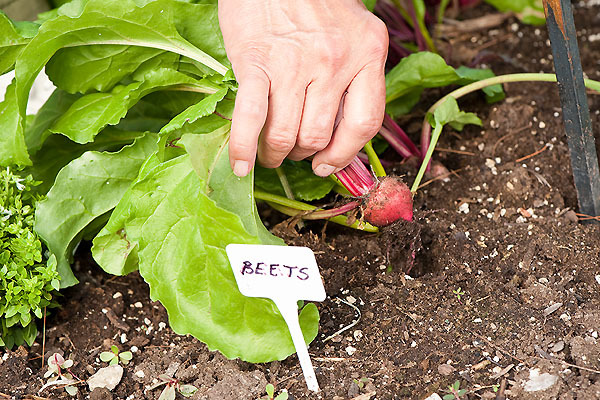 Gardening is a low-impact, enjoyable way to increase physical activity for people with or without chronic pain. Bryce Richter, University Communications, UW-Madison. The question is begged: is exercise cause or effect of the better health? “There have been many clinical, randomized trials, and they typically show a beneficial effect of regular exercise on symptoms, which argues against the possibility that [healthier patients] are simply more physically active to start off,” says Umeda. Both aerobic and anaerobic (resistance) exercise, such as lifting weights, seem to help in chronic pain, Umeda says. Researchers are also finding better effects from other disciplines, such as meditation, yoga and tai chi. Tai chi master Tricia Yu demonstrates the tai chi pose “bend bow and shoot tiger. 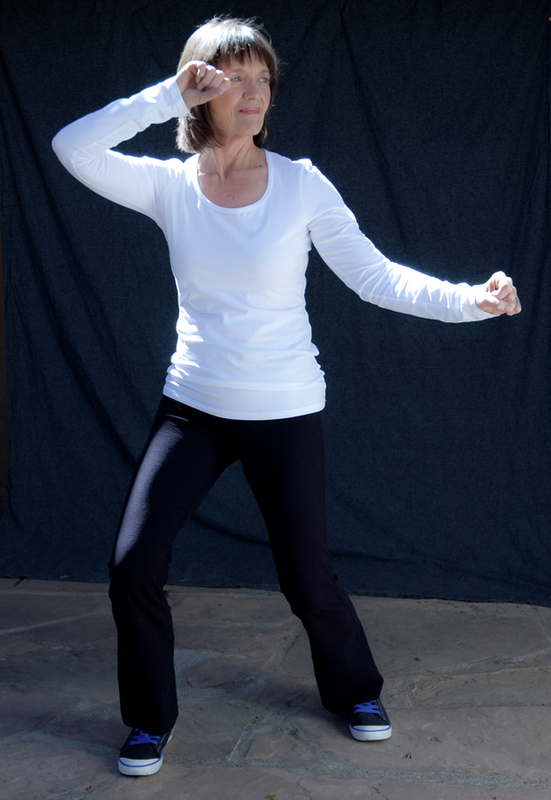 Yu started using tai chi with chronic pain long before it became fashionable. A systematicreview of “meditative movement therapies” (qigong, tai chi and yoga) found improvements in sleep disturbances, fatigue, depression and health-related quality of life, but not in pain. Exercise may also benefit fatigue, an understudied but significant symptom of fibromyalgia, says Joseph McVeigh, a lecturer at the Institute of Nursing and Health Research at the University of Ulster in the United Kingdom. A systematic review of earlier work published in 20144 found that exercise reduces fatigue and sleep dysfunction in fibromyalgia. “These are consistently reported to be among the most troubling symptoms of fibromyalgia,” McVeigh wrote to us. 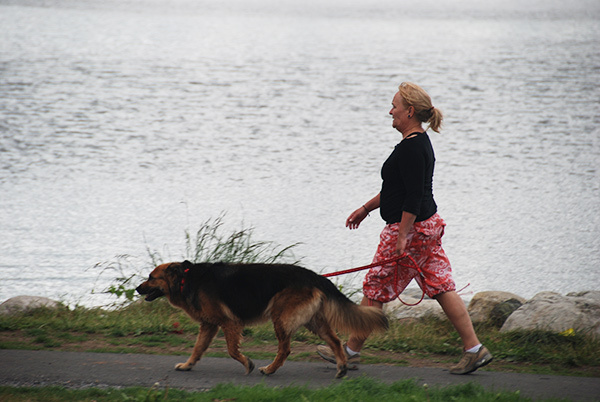 Walking, like many other forms of moderate exercise, can improve physical and mental health in chronic pain. In some ways, Muller says, “fibromyalgia is a 2 by 4 upside the head telling you your life has to change. A lot of people, particularly women, take care of others, rather than themselves. It’s often a lifetime of work getting to that place; there is muscle disuse syndrome, they have never exercised, have never had a program of taking care of themselves.